With summer already making its presence felt in the UAE and much of the region, productivity slumps in organizations are likely outcomes. 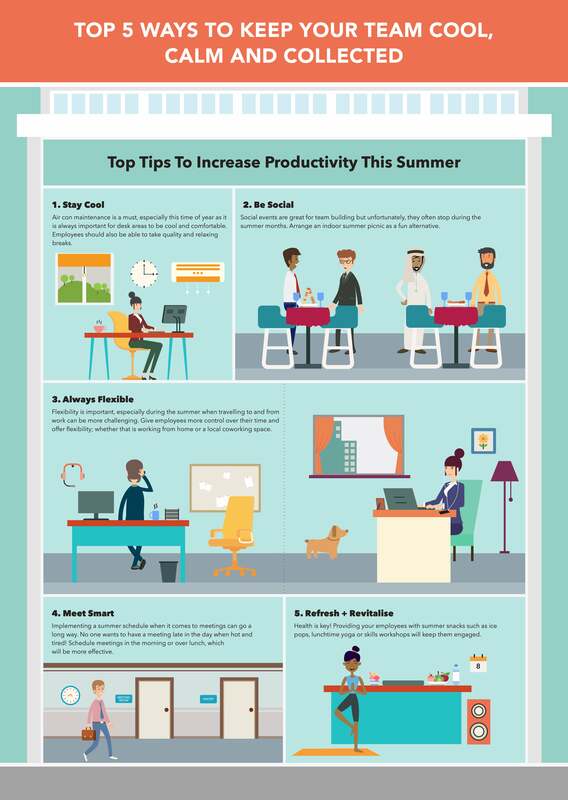 Backed by experiences in building and running coworking office environments, Dubai-based WorkSpace Commerce (WSC) has come up with an infographic titled Top Five Ways To Keep Your Team Cool, Calm, And Collected that offers some useful advice on managing team productivity levels this season. Not surprisingly, the guide lists efficient air conditioning maintenance in offices as a top way to tackle the issue, stressing on maintaining an optimum comfortable temperature across the space. Spending time together in a relaxed, social environment is also another way to beat the summer blues, and improving engagement, and the guide notes that indoor gatherings can be used to achieve this. Most notably, implementing a summer schedule when it comes to meetings can go a long way, says the infographic, offering a suggestion to professionals to schedule meetings in the mornings.